This article was updated with additional information on Tuesday, October 11, 2016 and Wednesday, November 2, 2016. Update: While the late Washington Elm between Communications and Clark Hall is unlikely to make a good candidate to take a cutting from to create a new scion, the UW Botanic Garden’s Washington Park Arboretum has another scion of the Washington Elm which will make a good candidate to take a cutting and create a new scion. A close-up shot of the split between the two of the three major limbs of the George Washington Elm. Original article: Early this morning Facilities Services’ Grounds Management discovered that the George Washington American Elm tree outside Clark Hall and the Communications Building, near the intersection of Pend Oreille Road Northeast and East Stevens Way Northeast, had split, potentially posing a hazard to campus. Crews are currently removing the split tree limbs, and the tree will be continuously assessed to see if parts of it can remain or will be removed. The tree is a genetically identical descendant from the famous Washington Elm in Cambridge, Massachusetts. Many believe that George Washington stood under the tree to accept command of the Continental Army in the Revolutionary War in 1775. The tree, prior to today, had multiple cables helping to stabilize various limbs. With only the trunk and one limb remaining the tree may be unbalanced and have to be removed entirely. Grounds Management will continue to assess the situation. If the tree is removed it will likely make a good candidate for the University’s Salvage Wood Program, making items out of trees that come down across campus. “We do think that the cables already in place helped it from splitting all of the way,” said Shores. Scion of the Washington Elm, Cambridge, Mass. The tree under which George Washington first took command of the American Army, July 3, 1775. 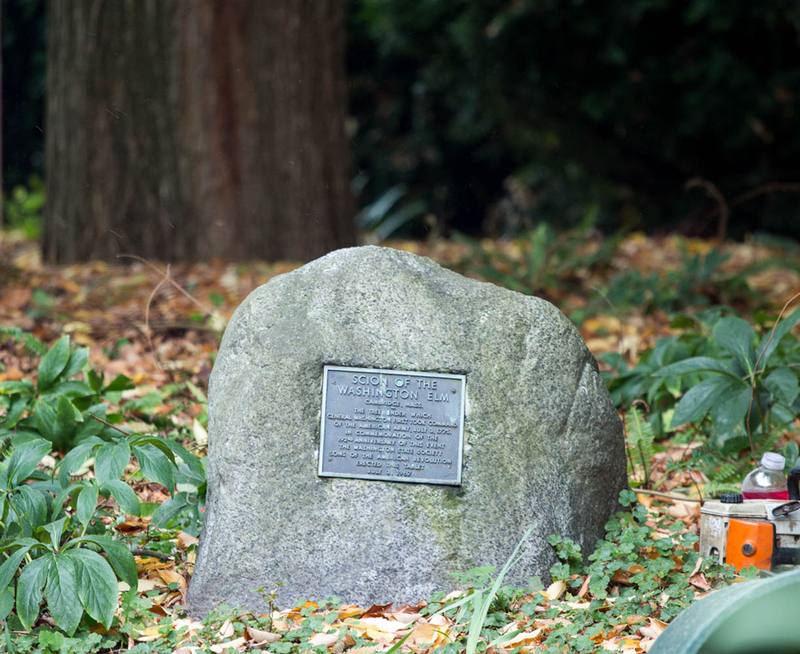 In commemoration of the 192nd anniversary of this event the Washington State Society Sons of the American Revolution erected this tablet. July 3, 1967. If you are on campus and hear a tree cracking or see limbs falling, first, stay away from the area! Then, contact Facilities Services by calling 206-685-1900, emailing careteam@uw.edu or filling out a work order. The tree is similar to a tree that was removed outside of Mary Gates Hall and the Allen Library earlier this year, although the George Washington tree is much larger. The Mary Gates tree was removed because of extensive decay. “I think this was a lot of people’s favorite tree. You could walk underneath it and have this nice canopy and look out over Lake Washington,” said Shores. As for replacing the tree, Grounds Management will take their own cuttings of the tree in an attempt to propagate their own scions. “We are also exploring the possibility of grafting this tree to a rootstock more resistant to Dutch Elm disease,” said Shores. 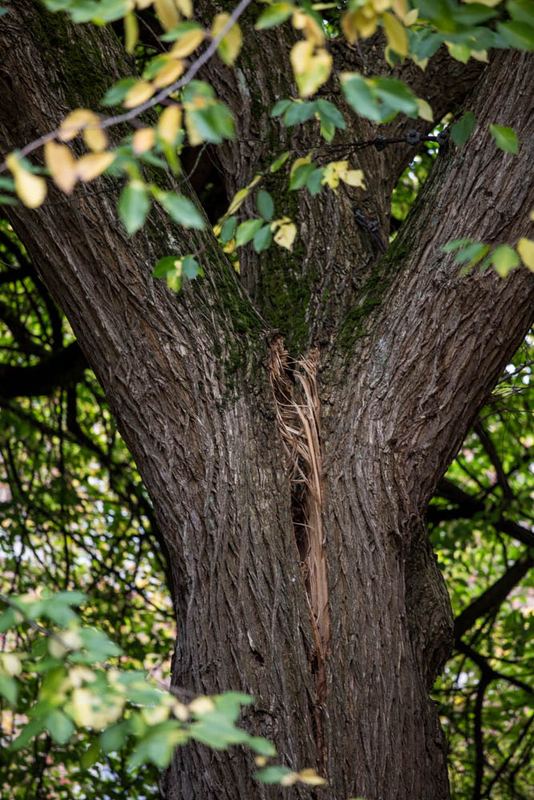 If Grounds’ attempts at using a cutting don’t work, the UW Botanic Gardens has generously offered to provide Grounds with a cutting from their own Washington Elm, a scion of the same tree. More history about the George Washington American Elm on the University of Washington campus can be found in University of Washington: An Architectural Tour.